There’s a lot of thought built up around first-mover advantage in tech. A head start is definitely beneficial, but unless it’s significantly before another competitor enters the market, it’s likely not enough to build an impassible moat. This is especially true in software, where it’s much faster to build product than in the physical world. Over the last couple years, we’ve seen first-movers surpassed by late entrants with much larger distribution networks. What happens in this scenario is a high-growth startup proves the business modal, scaling to hundreds of thousands or millions of users, and the distribution-mover—a slower growing organization already with access to millions of users—enters the market years later, introducing a similar product to its network. In the past, distribution-movers executed horribly and their products fizzled out with their large userbases. Typically these copycat products are comically bad and reinforce the “David and Goliath” narrative of startups. Lately, there are specific cases where Goliath executes well-enough to pass the first-mover. The canonical example is Facebook’s mass rollout of stories. Facebook tried for years to crush Snapchat with products like Poke and Slingshot. But these products were new and didn’t tap directly into Facebook’s massive distribution network. Even though Facebook aggressively promoted them, Poke and Slingshot still had to grow from zero users. People had to spend time downloading yet another app and learning to use something that looked foreign. The biggest problem was their friends weren’t on it. The network effect had to be bootstrapped. 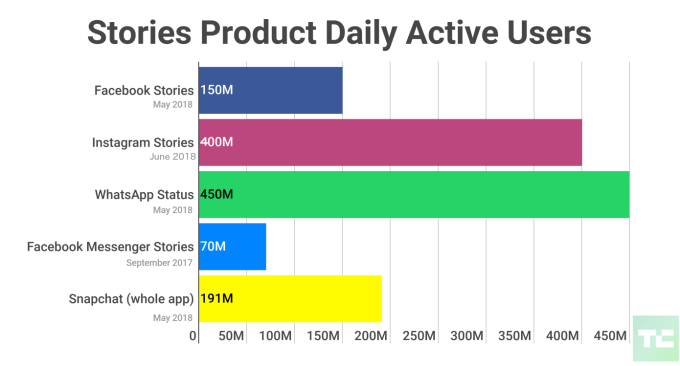 For Stories, Facebook solved all these problems by releasing not a standalone product, but a feature inside it’s already popular apps: WhatsApp, Instagram, and Facebook. Stories inside these apps took advantage of users’ existing habits and networks. Even though, stories was a close copy to Snapchat’s version (especially inside Instagram), there were many users that were using for the first time inside Facebook that never used Snapchat. Since Facebook unleashed stories, it’s spread like wildfire. Instagram has 400 million daily active users. And Instagram's version launched almost three years after Snapchat's. While Facebook had stunning success turning on a feature inside already at-scale products, others have had success releasing completely new products. This seems to only work when the first-mover’s product targets a very narrow demographic. Despite this product having rabid usage among a certain group, the distribution-mover is able to release a product catering to a much wider audience that was previously unserved or underserved. Venmo, a peer-to-peer payments app, is extremely popular with a subsection of millennials. It’s a verb (“Can you pay? I’ll Venmo you for it.”) and you would be hard-pressed to find someone in that demographic not using it. Usage isn’t as great for earlier generations and the tail end of millennials. In fact it drops off sharply on both ends. 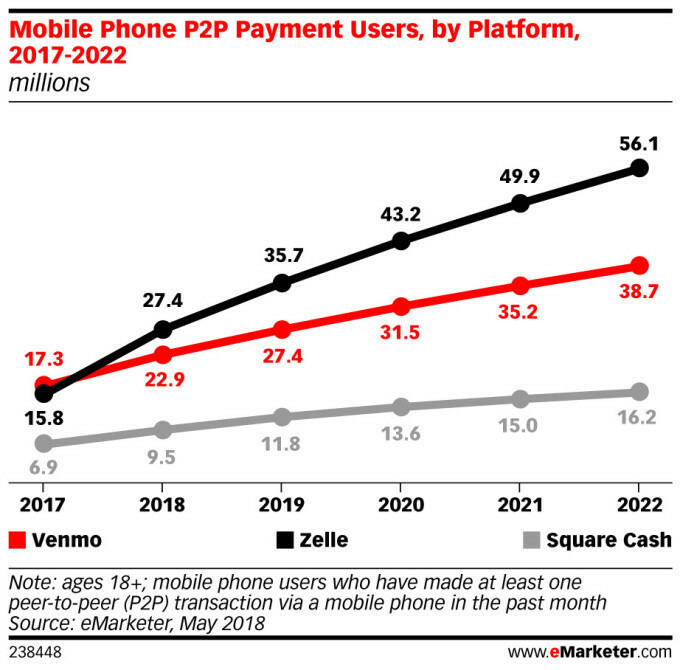 A similar app, called Zelle, launched years after Venmo with a couple key differentiators: It's backed by thirty US banks and it’s built in to a majority of their apps. When it initially launched, it was plagued by fraud, but now it’s growing much faster than Venmo and should pass it in late 2018 (Zelle launched publicly in 2017). The hybrid of Zelle being a standalone app, but also being baked into existing banking apps is really powerful. Those that don’t have the app can still transact with others that do. The massive distribution network Zelle was deployed to makes peer-to-peer payments accessible to many that didn’t trust or know about the concept before. Another interesting example that is in it’s infancy involves the free stock trading app, Robinhood. Robinhood gained four million users by creating a beautiful app that allowed you to trade stocks for free. Something that was very innovative considering most of the incumbents charged for their services. Yesterday, JP Morgan announced that they are going to do the same thing. Their distribution network is a staggering 34 million users—eight and a half times the size of Robinhood. JP Morgan might not be able to convert their entire network, but they likely don’t have to in order to become a serious challenger to Robinhood. The most interesting question will remain unanswered for the time-being: Did Robinhood build enough of a moat to protect themselves? Maybe, but I’m not convinced they’ll be able to rely on it if they want to stay ahead of the distribution-mover. They’ll likely have to come up with another main differentiator or risk being swallowed up. JP Morgan might fail to execute though. One of the key determinants of success is whether or not distribution-movers directly use their scale. Facebook stumbled at this originally, but finally figured it out, and it worked well for Zelle. Will JP Morgan be able to do the same though?